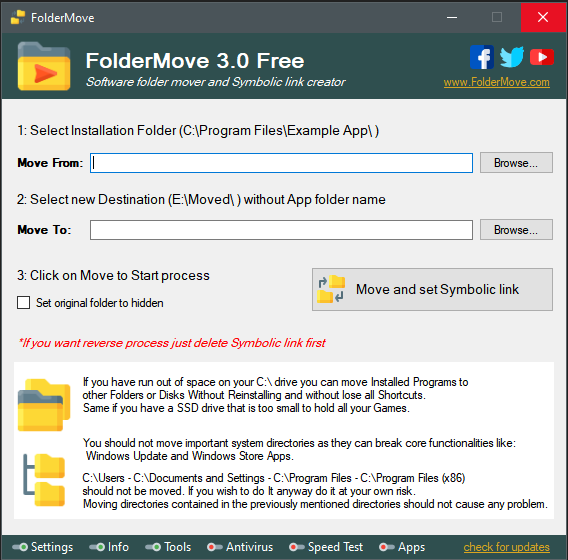 *FolderMove is the best definitive and Free solution for moving installations of your operating system by automatically creating symbolic links. Move the installation folder of a Program or Game to other drive, without breaking it or reinstalling. A symbolic link will be created from the old directory to the new one. Do you have a SSD drive that is too small to hold all your Games or Software? A symbolic link contains a text string that is automatically interpreted and followed by the operating system as a path to another directory. The symbolic link is a second file that exists independently of its target. If a symbolic link is deleted, its target remains unaffected. If a symbolic link points to a target, and sometime later that target is moved, renamed or deleted, the symbolic link is not automatically updated or deleted, but continues to exist and still points to the old target. It's a 100% free software for private, non-commercial use. A small executable file "500KB" to take with you anywhere. Must be run 'As Administrator' no permission to guest Account.